This ICTSD policy paper Value Chain Upgrading for Competitiveness and Sustainability: A Comparative Study of Tea Value Chains in Kenya, Sri Lanka and Nepal presents a comparative analysis of the export tea value chains in Sri Lanka, Kenya, and Nepal with a focus on how policy influences chain upgrading and the implications this has for trade patterns, competitiveness and sustainable development. 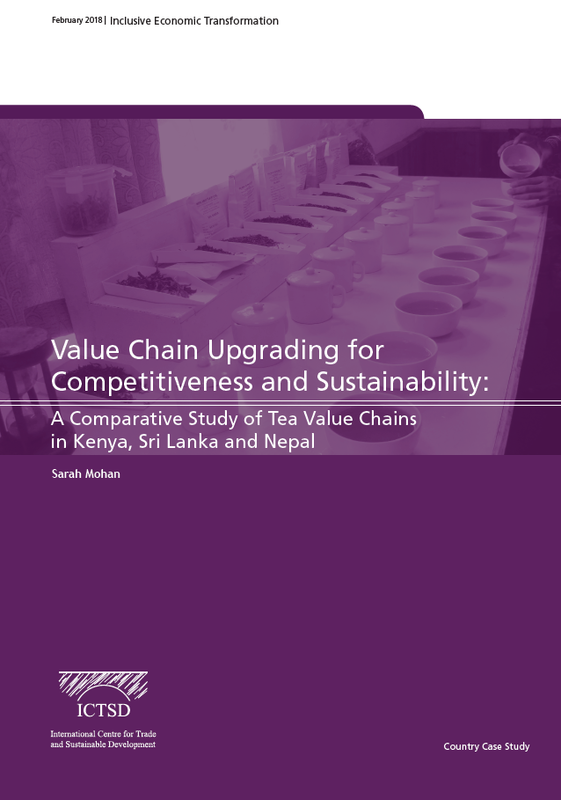 The comparison of tea value chains in Sri Lanka, Kenya, and Nepal is interesting because it sheds light on how different government policies, firm organisation and standard adoption led each country’s tea sector to occupy a unique competitive niche and set of sustainability impacts. In Kenya, policies that promoted productivity and supported the status quo in terms of firm ownership encouraged product upgrades which led to a competitiveness profile in high quality bulk exports. This strategy provided employment, stimulating consumption and fiscal linkages, but sparked little connection to the rest of the economy and had little scope for triggering economic development. In Sri Lanka, policies that incentivised functional upgrading encouraged a competitiveness profile in value-added packaged products which stimulated forward linkages from the tea sector to the rest of the economy, helping to trigger broad-based economic development. However, further steps are needed to ensure continued social and environmental benefits from this strategy. In Nepal, policies that promoted product upgrading from the bulk low-quality to the speciality subchain helped to diversify exports and earn higher revenues for a fraction of the output, but infrastructure, quality, and marketing remain a challenge. The Western Province in Sri Lanka is the most urbanised province in the country. Rapid urban growth has posed a number of problems. Ever-increasing vehicle traffic and commercial industries have contributed to increased environmental and air pollution.